Sen. Bernie Sanders (I-Vt.) and Rep. Peter DeFazio (D-Ore.) will announce legislation Wednesday to expand Social Security benefits and strengthen the retirement program for generations to come. There does seem to be more positive stuff in the Post and Times about Bernie than three or four years ago (of course not all positive). Might be another indication on how the Dem ground has shifted his way. The conversation around Social Security sometimes seems to take place in two separate worlds. On one side, there are people who believe the program is unsustainable in its current form, and that as the share of the population that is older than 65 continues to grow, Social Security will need to be adjusted to reflect that reality. On the other side are people who point out that not only is Social Security not particularly generous (it only replaces about 40 percent of pre-retirement income), but also we need to both alter its funding and what it pays out to account for the age of inequality, which is simultaneously increasing people’s dependence on the program even as it further undermines the program’s finances. One man firmly in the latter camp is Sen. Bernie Sanders (I-VT.), who is bringing back his Social Security Expansion Act on Wednesday. The day selected is no accident: Wednesday also marks something Social Security activists call Scrap the Cap Day, an annual event designed to highlight how little millionaires pay into the system. Sanders tells me that he believes momentum on the issue has shifted in recent years. As recently as a decade ago, even many Democrats agreed with Republicans that Social Security needed to be trimmed back. Now among his bill’s co-sponsors are several declared and potential presidential candidates, including Sens. Cory Booker (D-N.J.), Kirsten Gillibrand (D-N.Y.) and Jeff Merkley (D-Ore.). “I think most elected officials would be terribly, terribly unpopular if after giving a trillion-dollar tax cut to corporations and wealthy Americans,” they voted to take benefits away from those living on a Social Security stipend, Sanders said. (Note that Republicans, including Senate Majority Leader Mitch McConnell (Ky.), have stepped forward to argue just that.) Sanders’s office says an analysis by the Social Security Administration’s Office of the Chief Actuary says his bill would solidify the system for about 50 years. Larson’s bill would take us to the end of the century. So why not take the opportunity to simultaneously improve lives and bulk up Social Security? I can think of a lot of worse ideas. Confronting an economic landscape in which half of older Americans have no retirement savings and 20 percent of seniors are forced to live on income that barely exceeds the federal poverty line, Sanders’ legislation would significantly expand Social Security benefits and ensure the program remains solvent for at least the next five decades by subjecting all income over $250,000 to the Social Security payroll tax. Sanders officially introduced his legislation at a press conference alongside Rep. Peter DeFazio (D-Ore.) and Democratic Sens. Kirsten Gillibrand (N.Y.), Jeff Merkley (Ore.), and Cory Booker (N.J.). The legislation that Bernie Sanders proposed today goes in the opposite direction of austerity politics by strengthening and expanding Social Security. On the revenue side, it lifts the cap on payroll taxes so that the wealthy pay a more equitable share. Part of the reason why Social Security is now spending more than it takes in is because extreme income growth at the top, and stagnation at the middle and bottom, has created a situation in which the share of earnings above Social Security’s tax cap has nearly doubled, from 10 percent in the late 1970s to 18 percent today. That means that a billionaire pays the same amount into Social Security as someone who makes $132,900 a year. While people like me and most people I know pay payroll taxes on 100 percent of our incomes, ultra-wealthy figures like Jeff Bezos, who make most of their money on investments, pay only a minuscule proportion — as little as .00028 percent — for the same maximum benefits. By mandating that people who make over $250,000 a year pay full Social Security taxes, including taxes on unearned income, Sanders projects that Social Security would be solvent for the next fifty years and raise enough revenue to increase benefits across the board, along with expanding them for survivors, low-income seniors, and children of people with disabilities. It would also allow the Social Security Administration to use a more accurate cost-of-living adjustment formula, CPI-E, that factors in the spending habits specific to seniors. Sanders’ legislation comes after another Social Security expansion bill introduced recently in the House by Democratic representatives John Larson, Conor Lamb, and Jahana Hayes, though their bill increases benefits by scrapping the cap a bit higher, above $400,000. That legislation has 203 cosponsors and counting, so it has a very good chance of passing. Sanders’s bill is supported by many of the presidential hopefuls in the Senate, including Cory Booker, Kirsten Gillibrand, and Elizabeth Warren. What this means for 2020 is that the Clinton-Obama austerity politics of the not-so-distant past may have finally reached their limit. Americans are sick of having to do more with less. 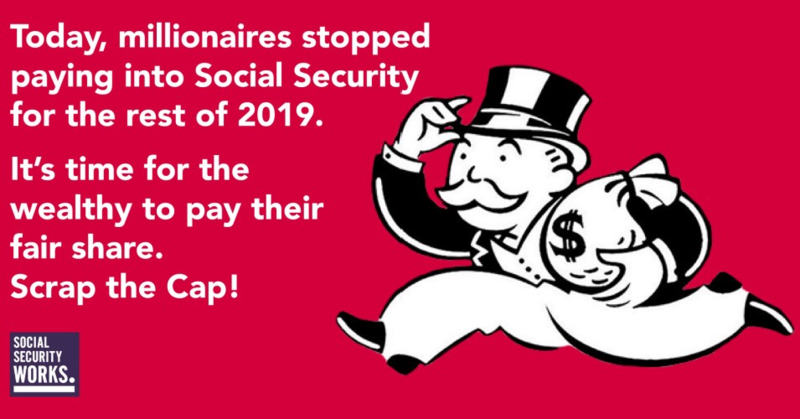 Billionaires and millionaires are going to have to pay up. I think they still withdraw from it as if it is the general fund, too. To wage wars. I could cry in gratitude. This was overdue and I am also very grateful for this effort. Donald Trump made $694 million in 2016. That means he stopped paying Social Security taxes 40 minutes into the year. Meanwhile a middle-class worker paid Social Security taxes the entire year. I say to Trump: pay your fair share. Let's scrap the cap and expand Social Security. It’s that time of year when folks making $1M have stopped paying into Social Security for 2019. This is why he should be the next President.